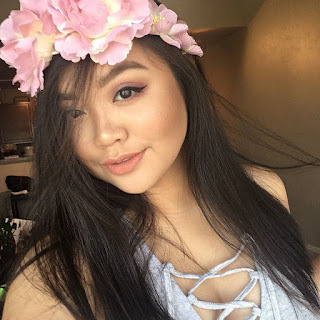 I tried very hard not to post while I'm not having a good day, but I realized everybody has their bad days. Just because something isn't going right the past couple if days, doesn't mean I should take it all and whine about it. Yesterday I went to an open house for a school I'm checking out. It went pretty well. I was supposed to go with my dad, but that didn't work out. I then asked my sister, but right before I left she said she can't come because she had to babysit. I felt pretty good about the open house. I usually wouldn't go to things like that alone, but I did. I was even actively participating with the discussions. After the open house, I got in my car and it wouldn't start. After a couple of tries, I gave up and sent my friend a text. It started to rain really bad. Seriously BAD! I felt like a modern day damsel in distress. After that I just went on and had myself a productive day. I know that yesterday didn't sound as bad as I made it seem, but that following really crappy days, I think I deserve to call it a bad day. I'm very proud of myself though for not sitting in a corner whining on facebook about how horrible the past couple of dats has been. Morale of the story I guess is to make the most out of your day. If you started off on the wrong foot, you have a whole 24 hours to make things right. You will never have this day back, so make the most out of it; so when you look back you won't regret anything. 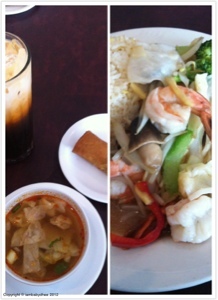 Oh here's a picture of the Vegetable and Shrimp Medley with Tom Yum soup and Thai Iced Tea I had yesterday. The veggie medley was a little too salty for my taste buds, but the Thai iced tea was rocking it.